The reconfiguration of the communication ecosystem in the network society has not only made the ubiquity of communication a reality, but it has opened the doors to a new historical stage of journalism. The emergence and popularization of the Internet, from the arrival of the web and finally driven by the social web, has left behind the communication model from one to many to enter the scenario of a communication from many to many, in which accessibility and mobility feed a model that multiplies the production of content and a greater role of active audiences. On the threshold of the so-called fourth industrial revolution, intelligent automation announces a new phase for global communication. Journalism, meanwhile, seeks a path of its own that allows it to fulfill its role in the network society. While the media industry tries to enter, with unequal successes, into the new ecosystem and the digital native media build renewed models that make their model sustainable, questions and challenges are multiplied both for professionals and for entrepreneurs in network projects and for society, which has placed journalism at the centre of the information landscape. All social actors know that the future is not written and new ways must be built on a day-to-day basis. From the trajectory harvested for more than a century and a half by journalism as we understand it today, with a good heritage, although punctuated by loss of credibility due to bas practices in different places and contexts, numerous innovative projects, professional groups and researchers in journalism and communication studies show alternatives for new times. 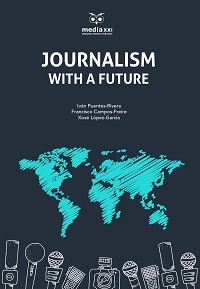 In the middle of important debates, in a renewed social, political and economic panorama, the journalism of the network society points ways that lead to quality journalism for the immediate future. Iván Puentes-Rivera. Degree in Advertising and Public Relations, Post-Graduate course in Research on Communication and PhD in Communication. Member of the research group “CP2: Persuasive Communication” of the University of Vigo. He has lectured at the Graduate Course in Advertising and PR. His research focuses on political communication, public relations and social networks. Pontevedra, Spain. Francisco Campos-Freire. Senior Professor of Journalism at the Faculty of Communication Sciences of the University of Santiago de Compostela (Spain). He has a BA in Journalism from the Faculty of Information Sciences in the Complutense University of Madrid, a MBA Degree in Industrial and Service Business Management, and a PhD in Communication and Contemporary History in the University of Santiago de Compostela. His research lines are focused on the study of Cultural and Communication Industries, management of informative and audiovisual business, communication policies, family business and research groups, analysis and accounting of quality in communication organisations, and corporate social responsibility. Santiago de Compostela, Spain. Xosé López-García. Professor of Journalism at the University of Santiago de Compostela. Coordinator of the New Media research group and director of the Department of Communication Sciences at the University of Santiago de Compostela. Santiago de Compostela, Spain.